N THEIR habits the Plovers are usually active; they run and fly with equal facility, and though they rarely attempt to swim, are not altogether unsuccessful in that particular. The American Ring Plover nests as far north as Labrador, and is common on our shores from August to October, after which it migrates southward. Some are stationary in the southern states. It is often called the Ring Plover, and has been supposed to be identical with the European Ringed Plover. It is one of the commonest of shore birds. It is found along the beaches and easily identified by the complete neck ring, white upon dark and dark upon light. Like the Sandpipers the Plovers dance along the shore in rhythm with the wavelets, leaving sharp half-webbed footprints on the wet sand. Though usually found along the seashore, Samuels says that on their arrival in spring, small flocks follow the courses of large rivers, like the Connecticut. He also found a single pair building on Muskeget, the famous haunt of Gulls, off the shore of Massachusetts. It has been found near Chicago, Illinois, in July. Plovers belong to a class of birds called Waders. They spend the winters down south, and early in the spring begin their journey north. By the beginning of summer they are in the cold north, where they lay their eggs and hatch their young. Here they remain until about the month of August, when they begin to journey southward. It is on their way back that we see most of them. While on their way north, they are in a hurry to reach their nesting places, so only stop here and there for food and rest. Coming back with their families, we often see them in ploughed fields. Here they find insects and seeds to eat. The Ring Plover is so called from the white ring around its neck. These birds are not particular about their nests. They do not build comfortable nests as most birds do. They find a place that is sheltered from the north winds, and where the sun will reach them. Here they make a rude nest of the mosses lying around. The eggs are somewhat pointed, and placed in the nest with the points toward the center. In this way the bird can more easily cover the eggs. We find, among most birds, that after the nest is made, the mother bird thinks it her duty to hatch the young. The father bird usually feeds her while she sits on the eggs. In some of the bird stories, you have read how the father and mother birds take turns in building the nest, sitting on the nest, and feeding the young. Some father birds do all the work in building the nest, and take care of the birds when hatched. Among plovers, the father bird usually hatches the young, and lets the wife do as she pleases. After the young are hatched they help each other take care of them. Plovers have long wings, and can fly very swiftly. The distance between their summer and winter homes is sometimes very great. 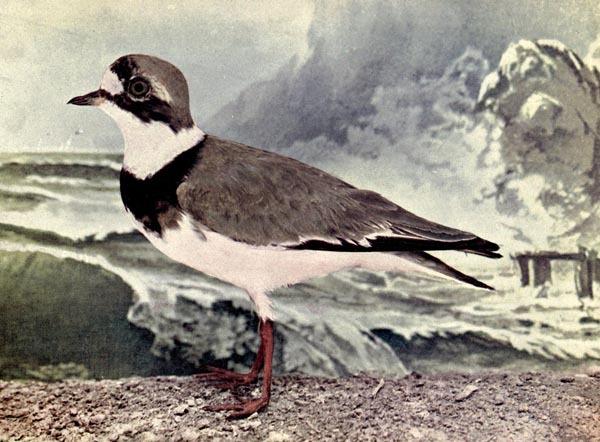 SEMI-PALMATED PLOVER.—Ægialitis semi-palmata. 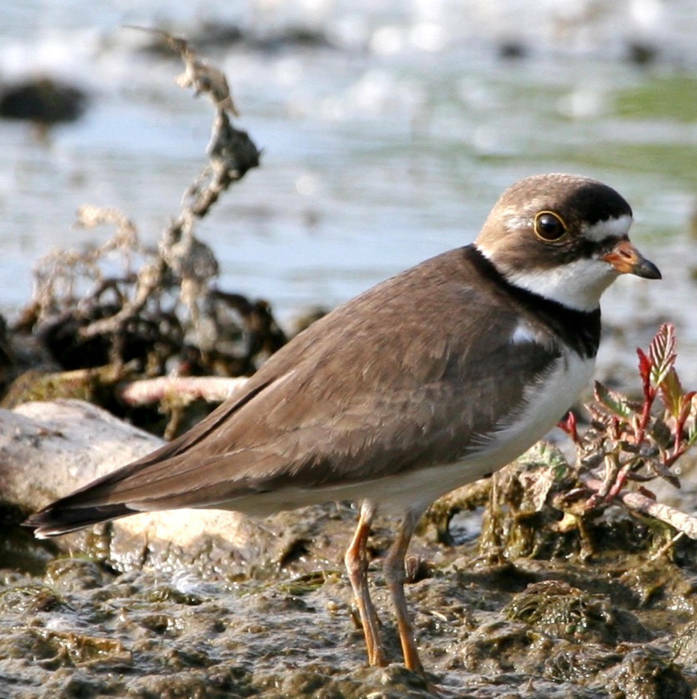 Other names: “American Ring Plover,” “Ring Neck,” “Beach Bird.” Front, throat, ring around neck, and entire under parts white; band of deep black across the breast; upper parts ashy brown. Toes connected at base. Range—North America in general, breeding in the Arctic and sub-arctic districts, winters from the Gulf States to Brazil. Nest—Depression in the ground, with lining of dry grass. Eggs—Three or four; buffy white, spotted with chocolate. 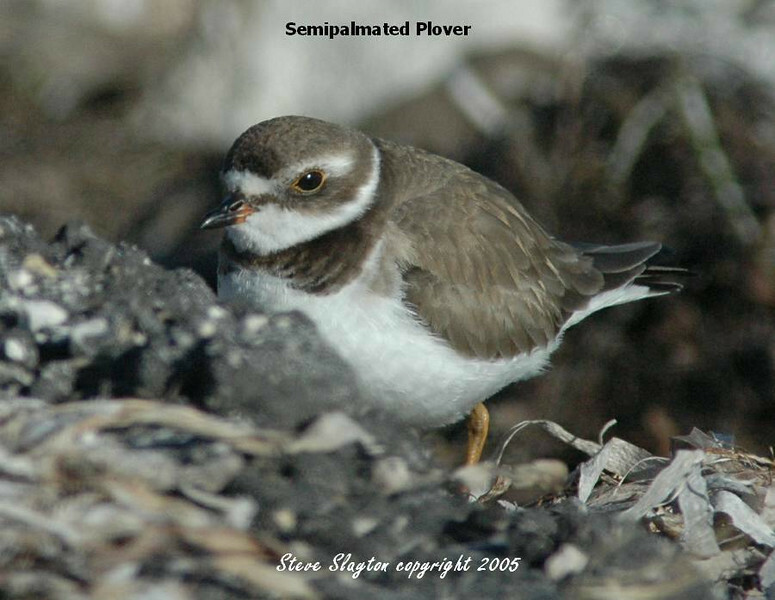 The Semipalmated Plover (Charadrius semipalmatus) is a small plover. We see them here at our shores. Florida has lots of shoreline. This species weighs 0.78–2.2 oz (22–63 g) and measures 5.5–7.9 in (14–20 cm) in length and 14–22 in (35–56 cm) across the wings. Adults have a grey-brown back and wings, a white belly, and a white breast with one black neckband. They have a brown cap, a white forehead, a black mask around the eyes and a short orange and black bill. Their breeding habitat is open ground on beaches or flats across northern Canada and Alaska. They nest on the ground in an open area with little or no plant growth. They are migratory and winter in coastal areas ranging from the United States to Patagonia. They are extremely rare vagrants to western Europe, although their true status may be obscured by the difficulty in identifying them from the very similar Ringed Plover of Eurasia, of which it was formerly considered a subspecies. This entry was posted in Birds, Kid's Section and tagged Birdwatching, Charadriidae, Christian, From The Past, Home School, Kids, Photography, Semipalmated Plover, Vol 1 #6 June 1897, Youth. Bookmark the permalink.